West Coast Camp Meeting, March 1998, is where it all started! At the Bayside Conference Center, on the former Naval Training Center, Dr. Rodney Howard Browne, missionary to America, brought churches together in an unprecedented manner. Many were touched by the Spirit of God and saved, healed and refreshed. Dr. Rodney & Adonica have continued to labor in this city at many different venues - the Star Theatre in Oceanside, Pechanga Casino and Resort, the Metro Church and, most recently, at the Abiding Place. Dr. Christian & Robin Harfouche christened The Galley on the former Naval Training Center as they ministered to hungry San Diegans in May, 1998. Christian Harfouche Ministries inspire believers to answer the call of God. Their heart is to equip a generation of miracle workers by the Word and the Spirit for the final harvest of souls. The heart of Holy Passion Conference was to bring a clear message to the church that now is the time to have a fervent and holy love for God. It was a week of inspiration, prayer and fellowship. It featured the ministries of Claudio Freidzon, Tommy Tenney, Marcos Witt, and Wesley Campbell. “Experience the supernatural power of God” was the banner cry for the two weeks of explosive meetings. Carlos Annacondia, who has been used by God to lead the Argentine revival led a nine day, bilingual soul winning crusade that featured dynamic preaching, miracles and many conversions. These meetings took place under the lights on the athletic fields of the former Naval Training Center. This event also featured morning meetings at the Abiding Place. The morning meetings were aimed at equipping churches to labor in the harvest. 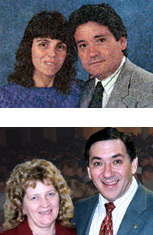 It was a special time, where Carlos and his wife, Maria were joined by his pastor, Pedro Ibarra and his wife, Gertrude. Revival Events 2000 featured monthly meetings with men of God who are being used to shake this nation. February featured Randy Clark, founder of Global Awakening. Evangelist Steve Hill, of the Brownsville Revival, followed in March. 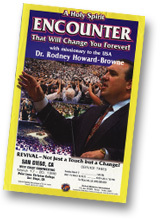 Dr. Rodney Howard-Browne of Revival Ministries International returned in April adding fuel to the fire. Evangelist Tommy Tenney, author of the best seller “The God Chasers” ministered in May. Evangelist Carlos Annacondia, author of “Listen To Me, Satan” lit up San Diego in early July. Delirious? With their renowned worship anthems ‘I Could Sing Of Your Love Forever’ and ‘Did You Feel The Mountains Tremble?’ could be heard as the band played a packed out Bayside Conference Center in July of 2000.In September Christian Harfouche of GlobalRevival.com returned and ministered the word of God with signs following! Tim Hall, one of Australia’s great evangelists, has blessed San Diego, ministering on an annual basis since 1993. Tim preaches an often humorous, strong faith-building word and moves in a great dimension of the supernatural and the miraculous. Governments have sponsored Tim’s crusades because of the incredible impact that Gospel, preached with power, has on their countries! The Region’s Beyond Conference in San Diego, featured mass crusade evangelists Mike Francen, Peter Youngren and Dr. Rodney Howard-Browne. This conference was for those who are serious about taking the gospel to the nations. Taught by the premier evangelists of the world who brought a wealth of knowledge and experience to bear in this 3 day event. Numerous sessions featured guest evangelist that have gone to the nations, preaching the gospel of the Lord Jesus Christ. In July, 2004, Brother Yun, from the bestseller book in 2003 “The Heavenly Man” honored San Diego as he ministered and testified of God’s miraculous power and faithfulness. Brother Yun has been arrested more than 30 times and tortured for preaching the gospel in China. His co-laborer, Pastor Xu Yongze, also ministered. He is the founder of the Born Again House Church in China which today is 20-25 million strong. He is also the founding president of Back to Jerusalem. Truly Champions of the faith!